Winter Warmer is a wonderful bouquet with festive shamrock blooms, gentle gerberas and Christmas carnations; elegantly arranged with winter pine cones and jolly berry. The arrangement is nested on our finest green foliage to create this wonderful Christmas bouquet. 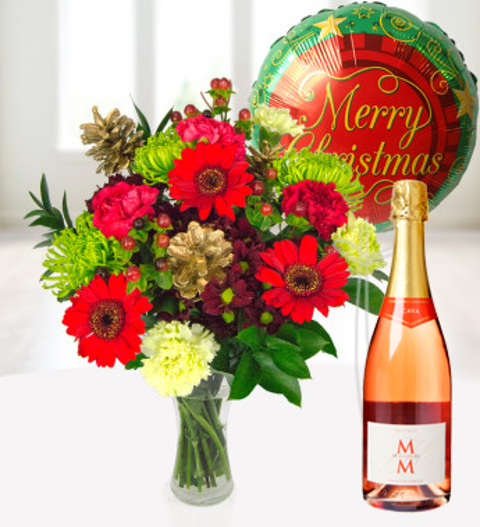 Also included is a delicious bottle of Rose Cava 750ml 12%, a festive helium balloon and a FREE box of delicious Belgian chocolates. This arrangement comes with a FREE box of fine Belgian Chocolates! Chocolates may contain nuts.